Seats for Landing: Bargain misery for only £1 ! Today I am reminded why I usually don't allow my kids to have random presents on a whim - no matter how cheap. Earlier I weakened and gave in to Hugh who wanted a polystyrene plane. Well, it' s only a pound, I thought! Tess (reasonably) then wanted her pound's worth but couldn't find anything in Asda's 'cheap crap' section to satisfy her. I said I had a 'wee thing' at home and would give it to her. Cut to: We arrive home. Tess decides that the Snoopy lip balm I had in a drawer was not up to standard and 'not a toy'. She falls into wails of sobbing and crying. 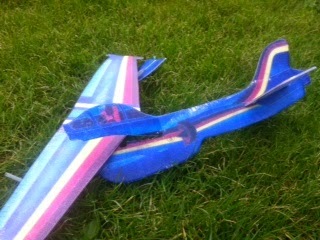 Meanwhile Hugh's plane snaps in two on it's second test flight about the garden. He too joins in the histrionic wailing. The combined wailing - peppered with 'it's not fair's - goes on for the best part of an hour. Quite a bargain for a £1 coin. JUST STAY STRONG. The pound shop is a bargain with the devil.